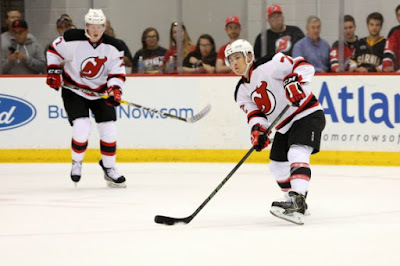 Junior Bobo Carpenter talked with The Hockey Writers about his summer experience at development camp of the New Jersey Devils with whom his father, Bobby Carpenter, won the Stanley Cup as a player in 1995 and as coach in 2003. ►InsideHockey.com reviews BU's 2016-17 season, when the Terriers reached the NCAA West Regional Final and finished with a #6 ranking, and previews this year's team featuring 17 holdovers and 10 new faces. ►Redshirt sophomore Max Prawdzik, back on Comm. Ave after leading the Lone Star Brahmas to the NAHL Championship, introduces his new goalie mask. TSN’s Bob McKenzie has announced his pre-season Top 20 for the 2018 NHL Entry Draft with a current Terrier and a future Terrier among his picks. Freshman Brady Tkachuk is ranked #3 while 2018 recruit Joel Farabee is #19. ►Seven future Terriers will be in action this weekend as the NTDP U17s and U18s will play preseason games against the NAHL Minnesota Wilderness. Tonight, the U17s host Minnesota with two 2019 recruits— forward Trevor Zegras (photo) and defensemen Case McCarthy—and a 2020 recruit—defenseman Alex Vlasic—in the line-up. On Saturday, when the U18s take on the Wilderness, the line-up will include 2018 recruits Farabee, Tyler Weiss, Jake Wise and Jack DeBoer. 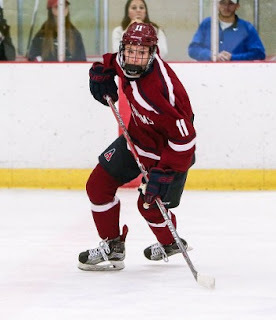 Farabee, who led last year’s U17s in scoring (17-14-31), Weiss, who led the U17s in assists (8-21-29), and Wise (8-18-26) will join Tkachuk at next Thursday’s All-American Prospects Game in Buffalo, which will be live-streamed free on HockeyTV. Com. A link to the game will appear here at 6:45 p.m. on Sept. 21. 2018 recruit Ryan O’Connell has begun his season with the Penticton Vees. The @OttawaJrSens dressed '02 F Dylan Peterson (Boston Univ.) last night; Peterson youngest player to play a #CCHL 17-18 reg-season game. Heading into the final year of his entry level contract, former BU All-American and Hobey Baker Award winner Jack Eichel is challenging himself to step up his game and help lead the Sabres to a winning record and its first Stanley Cup playoff appearance since 2010-11. Eichel scored 56 points (24G, 32A) as a rookie and then 57 points (24G, 33A) in an injury shortened (61 games) season. Former BU standout Evan Rodrigues played 30 games for the Sabres last season. HockeyBuzz.com explores his chance to nail down a bottom six spot in Buffalo with his versatility and shooting ability as his strong suits. Former Terrier assistant captain Matt Lane has signed an AHL contract with the Bridgeport Sound Tigers. Last season, the Rochester, N.Y. native had an 11-13-24 scoring line in 45 games for the ECHL Elmira Jackels and also saw time with the AHL Rochester Americans. Lane had 69 points as a Terrier, including 28 in his senior season. Terriers have named three assistant captains for the 2017-18 season. Seniors Victoria Bach and Erin O’Neil and junior Sammy Davis join captain Rebecca Leslie as the team’s leadership group. BU’s season begins Sept. 22, hosting Concordia in an exhibition game, followed the next night with a home game against Merrimack.